A true picture of a hypocrite is someone who pretends to be something they are not. They hide behind masks they create to be what they think others will accept. There is the person that hides behind their intelligence. They believe in scientific fact and unless that fact can be proven by physical evidence it is not true. This person believes they are the lord over their life and faith in the Gospel of Jesus Christ is not a material fact. There are those who once a week on Sunday pretend to be religious. They pretend to be more spiritual that what they really are. They pretend to pray but do not. They pretend to give but do not they pretend to love other people but their words are toxic towards the true believers. Then there are those who are frightened insecure little children who hide behind their anger and their image of superiority. They are emotional bullies who are constantly trying to intimidate and control others, however inside they are cowardly little children. The ability to distinguish between yourself and each of the identities you have created is important.. Peer pressure and the desire to be recognized causes us to create identity traits that help separate us as an individual. These identities or traits we create to fit in with others, can go against our faith and lead us into trouble. People play roles and other people accept them , not for who they are, but by the role we play. This is extremely dangerous for our emotional well being. When we build a relationship with people we play roles with, we are in jeopardy of losing their friendship if they ever change. You will wake up one day wondering, “ Who am I.” Be yourself. Accept yourself for who you are. The character traits that I try to follow are the same traits that Jesus portrayed while He was here on this earth. The appearance and speech of Jesus Christ was so common that when the Roman soldiers came to arrest Him they had to have Judas kiss Him on the cheek so they would know who He was. Don’t let the worldly things of this life define your character. Tattoos, piercings, cars, and clothes are all the character traits of Satan. Love, joy, peace, patients, kindness, goodness and faithfulness are the character traits of God. I am already an individual created by God. Popularity and the latest fashions at school or work does not make us who we are. It is the character traits that God created inside of us that counts. 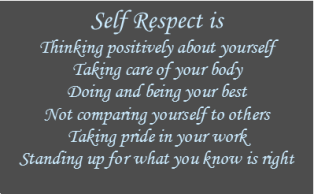 Self respect creates leadership.